Meet JetTabs, a definitely a new word in creating tabs and accordion blocks without any coding knowledge and skills for Elementor live page builder! The plugin has a clear interface and fits just fine for creating all kinds of vertical and horizontal tabs, accordion blocks with loads of spectacular content and imagery. It makes possible to create just the very type of content organization You need even if You don’t have loads of experience. Discover the ultimate potential of the Tabs widget, which makes the process of adding content into the tab blocks as easy as it can be. All You’ll have to do is create the templates in Elementor live page builder with the needed layout, background and content, and them select it from the list of existing templates and pages to assign it to one of the tabs! And there are also loads of style settings, allowing to change the tabs appearance at will, and even create the tabs within the existing tabs! Are You fond of organizing content on the pages into neat and classy-looking accordion blocks? 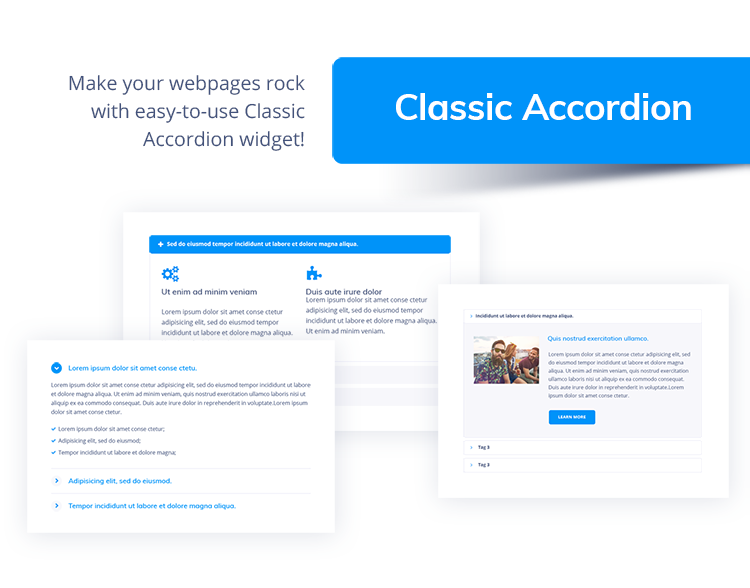 In this case You’ll definitely enjoy the Classic Accordion widget, which allows placing the previously made templates into the accordion blocks, which can be unfolded and folded whenever there is a need. The widget really adds lots of extra points to the page’s general neat appearance and compactness of the content, allowing to add more content even when there’s not so many place left for it! Image Accordion is one of the most spectacular widgets for Elementor live page builder! It becomes a real asset for You when it comes to displaying imagery in a totally eye-catching way of vertical and horizontal accordions! Enjoy playing around with the overlays, border radius values, inner content, like buttons and text passages, all placed into the Image Accordion blocks, switching smoothly on hover! You’ll be able to customize the content and looks of the JetTabs accordion and tabs blocks to make them totally fit for the page’s appearance! The vast number of style settings will become a huge asset for everyone fond of pixel-perfect design and clean typography, and there are still so many more options to discover! All of the JetTabs widgets are fully responsive, so You can be sure Your content will look great on all kinds of screens regardless what device the visitor is using! You’ll be able to set different height and width values for different devices, apply different paddings, margins, and everything will work smoothly! JetTabs plugin is an easy-to-use addon allowing to add stylish tabs and accordion blocks to the webpages and enrich them with content, which can be built using Elementor widgets and sections structure. The plugin is simple in customization, and can become a true asset for those who value style and efficiency!